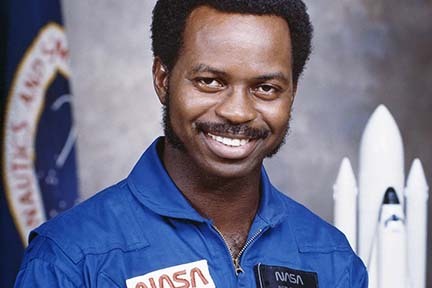 Ronald Erwin McNair was born on October 21, 1950, in Lake City, South Carolina. He dreamed of becoming a scientist. In spite of the challenges he faced as a result of being born into a climate of racial segregation, his hard work and persistence paid off: He was valedictorian of his high school graduating class and was accepted by North Carolina A&T University. In 1971, he graduated with a Bachelor of Science in Physics. He went on to graduate school at the Massachusetts Institute of Technology (MIT) and earned his Ph.D. in quantum electronics and laser technology in 1976. His achievements include being named a Presidential Scholar, a Ford Foundation Fellow, a National Fellowship Fund Fellow, a NATO Fellow, winner of the Omega Psi Phi Scholar of the Year Award, and Distinguished Alumni Award. He was also an accomplished saxophone player and held a fifth degree black belt in karate. While at MIT, Dr. McNair contributed to some of the earliest development of chemical HF/DF and high-pressure CO lasers. His later experiments and theoretical analyses added to the understanding and applications for highly excited polyatomic molecules. In 1975, he studied laser physics with experts in the field at Ecole Dete Theorique de Physique, Les Houches, France. He published several papers about lasers and molecular spectroscopy and presented his findings at numerous conferences in the United States and abroad. Following his graduation from MIT, he took a position as staff physicist with Hughes Research Laboratories in Malibu, California, where he worked on the developing lasers for isotope separation and photochemistry using non-linear interactions in low-temperature liquids and optical pumping techniques. He also conducted research on electro-optic laser modulation for satellite-to-satellite space communications, the construction of ultra-fast infrared detectors, ultraviolet atmospheric remote sensing, and the scientific foundations of the martial arts. In January 1978, NASA selected Dr. McNair as an astronaut candidate. After training for a year, he was qualified as a mission specialist astronaut and eligible for assignments on Space Shuttle flights. His first mission launched from Kennedy Space Center in Florida on February 3, 1984. His first flight successfully accomplished the proper shuttle deployment of two Hughes 376 communications satellites. This mission marked the first flight of the Manned Maneuvering Unit and the first use of the Canadian arm, operated by Dr. McNair, to position EVA crewman around the Challenger's payload bay. Dr. McNair also assumed other responsibilities: the German SPAS-01 Satellite, acoustic levitation and chemical separation experiments, the Cinema 360 motion picture filming, five Getaway Specials, and other mid-deck experiments. The Challenger concluded its mission in the first landing on the runway at Kennedy Space Center on February 11, 1984, and Dr. McNair logged 191 hours in space. On January 28, 1986, Dr. McNair joined the Space Shuttle Challenger on his second mission to space. Shortly after liftoff, the Challenger exploded and, tragically, all seven people aboard were killed, including spacecraft commander Mr. F.R. Scobee, pilot Commander M.J. Smith (USN), mission specialists Lieutenant Colonel E.S. Onizuka (USAF), and Dr. J.A. Resnik, and two civilian payload specialists, Mr. G.B. Jarvis and Mrs. S. C. McAuliffe. Dr. McNair is survived by his wife Cheryl and their two children. He was posthumously awarded the Congressional Space Medal of Honor. Dr. McNair was the second African American to fly in space. Shortly after Dr. McNair’s death, members of the United States Congress named a federal grant program in his honor to recognize his remarkable academic and professional achievements and to encourage low-income, first-generation college students and/or traditionally underrepresented in graduate education to pursue doctoral study. The program serves as a living memorial to honor a man who conquered the obstacles of racial segregation and poverty to earn a Ph.D. in physics and to realize his dream to become an astronaut. Dr. McNair’s life personified his belief that "true courage comes in enduring, persevering, preparation and believing in oneself." The St. Edward's University McNair Program provides services that will enable low-income first-generation college students and students from groups underrepresented in college education to pursue doctoral study by providing activities that will implement the following prescribed objectives. An evaluation will provide a means for collecting quantifiable data and documentation to verify successful completion of activities. 90 percent of McNair Program participants served during the project year will have completed appropriate research or scholarly activities during the McNair Program academic year. 60 percent of bachelor’s degrees recipients (or equivalent) will be accepted and enrolled in a postbaccalaureate program of study by the fall term of the academic year immediately following completion of the bachelor’s degree (or equivalent). 95 percent of first year graduate students will continue to be enrolled in graduate school at the beginning of the fall term of the next academic year. 15 percent of McNair Program participants served will attain a doctoral degree within ten (10) years of the attainment of the bachelor’s degree.